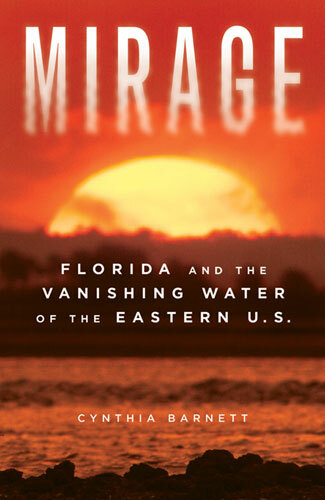 Florida's Eden, a non-profit devoted to building a model sustainable environment and economy in 30 North Florida counties, has chosen Mirage: Florida and the Vanishing Water of the Eastern U.S. for a One Region/One Book project. Read the press release. Visit the website. Part investigative journalism, part environmental history, Mirage reveals how the eastern half of the nation—historically so wet that early settlers predicted it would never even need irrigation—has squandered so much of its abundant fresh water that it now faces shortages and conflicts once unique to the arid West. Florida's parched swamps and supersized residential developments set the stage in the first book to call attention to the steady disappearance of fresh water in the American East, from water-diversion threats in the Great Lakes to tapped-out freshwater aquifers along the Atlantic seaboard. "In the days before the Internet, books like Rachel Carson's Silent Spring and Marjory Stoneman Douglas' River of Grass were groundbreaking calls to action that made citizens and politicians take notice. Mirage is such a book." "Never before has the case been more compellingly made that America's dependence on a free and abundant water supply has become an illusion. Cynthia Barnett does it by telling us the stories of the amazing personalities behind our water wars, the stunning contradictions that allow the wettest state to have the most watered lawns, and the thorough research that makes her conclusions inescapable. Barnett has established herself as one of Florida's best journalists and Mirage is a must-read for anyone who cares about the future of the state." "Mirage is the finest general study to date of the freshwater-supply crisis in Florida. Well-meaning villains abound in Cynthia Barnett's story, but so too do heroes, such as Arthur R. Marshall, Jr., Nathaniel Reed, and Marjorie Harris Carr. The author's research is as thorough as her prose is graceful. Drinking water is the new oil. Get used to it." "A rigorous look at the relentless pressure of development and burgeoning human populations on natural water supplies, particularly in the wetlands of Florida. . . .Barnett finds that successful allocation agreements are rare, lessons learned are quickly forgotten and an ever-growing population spells more trouble to come. . . ."
"History, policy analysis and explanation in one, written accessibly for the interested layperson. . . .a great reminder that our profligate ways could lead us into (more) serious trouble." "With lively prose and a journalist's eye for a good story, Cynthia Barnett offers a sobering account of water scarcity problems facing Florida—one of our wettest states—and the rest of the East Coast. Drawing on lessons learned from the American West, Mirage uses the lens of cultural attitudes about water use and misuse to plead for reform. Sure to engage and fascinate as it informs." Cynthia Barnett, a reporter for Florida Trend magazine, has been a newspaper and magazine journalist for twenty years. Her numerous journalism awards include three investigative-reporting prizes in the Green Eyeshades, which recognize the best journalism in eleven southeastern states. Barnett earned a bachelor’s in journalism and master’s in environmental history from the University of Florida. In 2004, she was awarded a Knight-Wallace Fellowship at the University of Michigan, where she spent a year studying freshwater supply. She lives in Gainesville, Florida. ". . . a rigorous look at the relentless pressure of development and burgeoning human populations on natural water supplies, particularly in the wetlands of Florida. . . . Barnett finds that successful allocation agreements are rare, lessons learned are quickly forgotten and an ever-growing population spells more trouble to come. . . . this comprehensive and well-referenced volume feature[s] appearances from well-known figures like Walt Disney, Jeb Bush and Hurricane Katrina, and should become vital reading for citizens and policymakers as global concerns over water scarcity grow." ". . . history, policy analysis and explanation in one, written accessibly for the interested layperson and without the tone of environmental screed. . . . a great reminder that our profligate ways could lead us into (more) serious trouble. . . ."
"Anybody interested in water resource management or environmental history, particularly in the southern United States, will want to read this book . . . Mirage is a much-needed addition to the history of water supply and management, not only for Florida and the eastern United States but also for the American South." Copyright © 2007, Cynthia Barnett. All rights reserved.